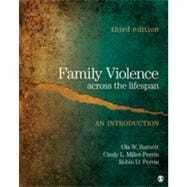 Family Violence Across the Lifespan, Third edition, will continue in the same spirit of previous editions of providing the most comprehensive and research-based text on family violence. The book will be updated to provide state-of-the-art information that helps students achieve a deeper understanding of methodology, etiology, prevalence, treatment, and prevention of family violence. Research from experts in the fields of psychology, sociology, criminology, and social welfare is woven together to provide broad coverage of current viewpoints and debates within the field. Focusing on accessibility this new edition will include new summaries, visual enhancements and new content, while continuing to provide the most comprehensive and research-based text on family violence. This textbook really helps cover all bases with regards to family violence. It lays out the information in an easy to understand format. This is a textbook that I need for one of my course for a degree that I am reading in Child and Family Studies. Unlike many other textbooks, this book is worth reading. It is full of very current and updated information and covers a broad spectrum of family violence. Family Violence Across the Lifespan : An Introduction: 4 out of 5 stars based on 1 user reviews.